Inspired by the movie and the 70’s inspired fashions in Yorkville, I turned to one of the few 60’s and 70’s pattern designers whose books are still widely available: Elizabeth Zimmerman. 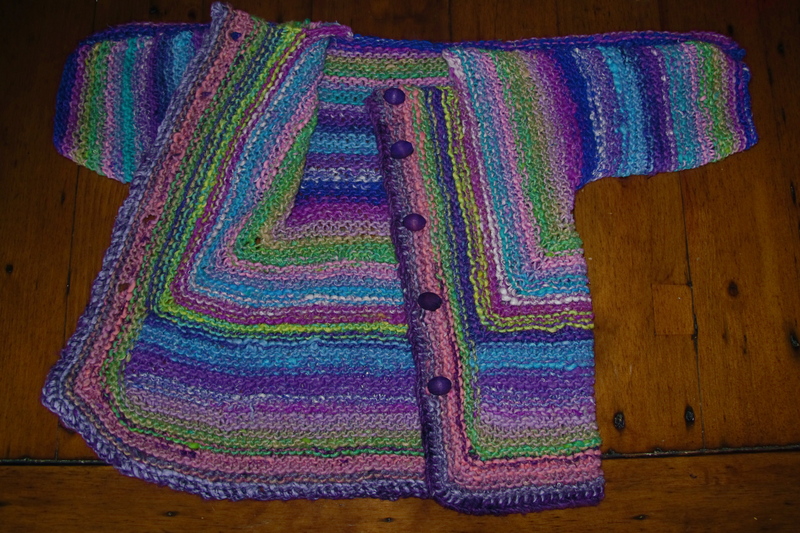 My first experiment with retro patterns was her 1968 Baby Surprise Jacket. Named “surprise” because it is knit in one bizarre piece, then miraculously folds into a sweater for your baby or toddler. The differences between contemporary patterns and Elizabeth Zimmerman’s go way beyond the groovy style. The surprise jacket is not at all technically challenging, it is mostly just knit in garter stitch with a few simple increases and decreases. It is however, mystifying from a reading comprehension perspective. Zimmerman’s writing style approaches stream of consciousness. She writes long paragraphs and asides and switches vocabulary midway through the pattern (switching from “rows” to “ridges” to “decreases”). 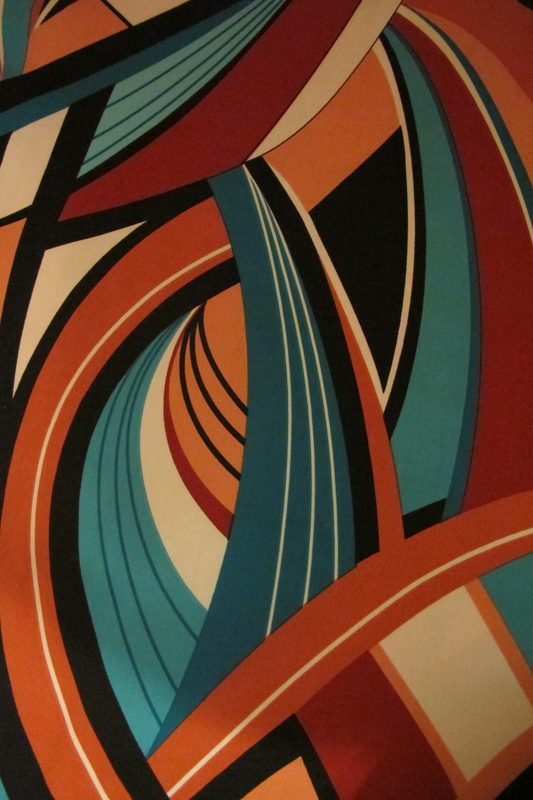 If like me, you usually rush headlong into patterns: STOP! You need to read the whole pattern, and count out the rows before it is too late. For example, when she writes “At 114 sts,” it’s good to know that means 12 more rows. I found doing the math before hand, and annotating my pattern to be much less time consuming than counting stitches. She is also quite vague about gauge and sizes. She doesn’t suggest a size of needles or give any specific yardage. 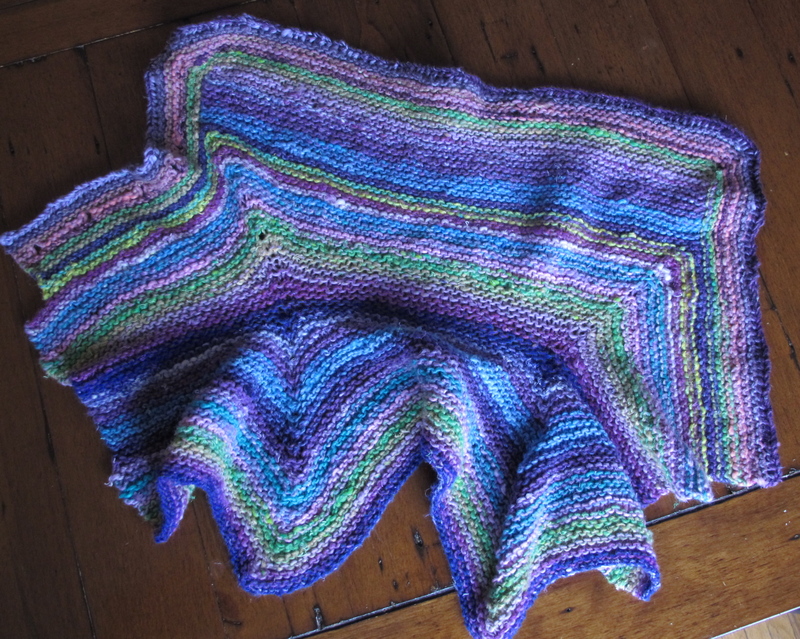 The pattern simply offers that a gauge of 6 sts to the inch will yield a present for a newborn and that 5 sts to the inch will be right for a “1-year-old or older.” There are, however, thousands of projects on ravelry that can offer some suggestions in that direction. As someone who is trying to find new challenges as a knitter, I really enjoyed her open ended style. I felt like I was sitting down with someone’s fantastically talented grandma for a little chat about knitting, and that she figured I knew enough to put my own stamp on things. However, I imagine that her style might be frustrating for a beginner. Experienced knitters won’t need to watch every episode in its entirety, but it helped me make sense of some of the more inscrutable directions (her pattern literally includes the phrase “Hope you’re still with me”). Noro. Both sweaters remind me of girl’s sweaters I spotted at Benetton and the Baby Gap this fall. I think the purple colourways (I had lots of tiny scraps, and just used anything purple-ish) turned out even better; it’s not quite the bold statement the original was. 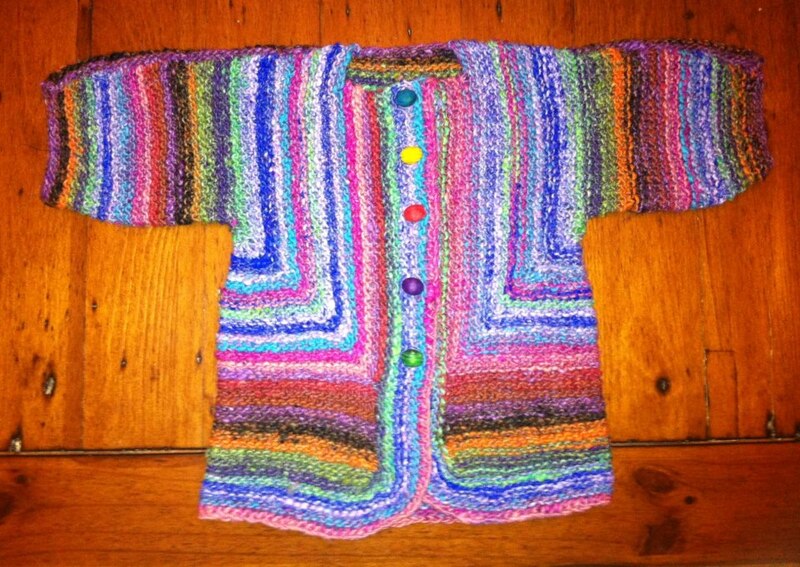 This entry was posted in Knitting, Retro patterns, Sweaters, Toddler knits and tagged Elizabeth Zimmerman, knit, Noro, Retro, sweater, toddler on October 29, 2012 by lisagono. out of curiosity, do you have the original version of the knitter’s almanac or the anniversary edition? is it worth the extra $$ to get the anniversary edition? I have the original – I actually didn’t know there was an anniversary edition!